Rotating speaker (Leslie) simulation. Choose cabinet size: Standard [STNDRD] or over-sized [GIANT]. All H9 algorithms require an H9 stompbox to function. To demo or purchase any algorithm, please download the the H9 Control app. Important: To have access to all algorithms and functionality, please make sure to download the latest version of H9 Control and also update the firmware on your H9(s). Click here for Update Instructions. Select Standard [STDRD] or Giant [GIANT] size cabinets. Sets the rotation speed of the rotor (low frequency) speaker. Sets the rotation speed of the horn (high frequency) speaker. Sets the balance between the rotor level and horn level. Controls the amount of modulation of the Depth parameter. Analogous to AM (Amplitude Modulation). Controls the amount of modulation of the Speed parameter. Analogous to FM (Frequency Modulation). Sets the secondary LFO rate – determines how fast the D-Mod and S-Mod “wiggle” their targets. Ranges from 1/8 to 8X the Speed value. Note: If Envelope or ADSR is selected as the Mod Source, the modulation is driven by the amplitude of the audio input and the speed modulation control [S-MOD] becomes a Sensitivity control. Selects the secondary LFO modulation source. The choices are: [SINE], TRIANGLE [TRIANG], [PEAK], [RANDOM], [SQUARE], [RAMP], Sample and Hold [SMPHLD], Envelop [ENVLOP], or [ADSR]. In addition, the Expression Pedal [EXPPDL] can be chosen as a source. When [EXPPDL] is chosen, the current preset’s pedal mapping is ignored. At 0 the output level is unaffected. Increase the output level of the effect by up to 20 dB or lower by 30 dB. Tempo is turned ON/OFF on the H9 by simultaneously pressing the Right Footswitch and the PRESETS button. With Tempo OFF, tapping can be used to adjust delay parameter values (displayed as milliseconds or Hz). With Tempo ON, tempo is in BPM. 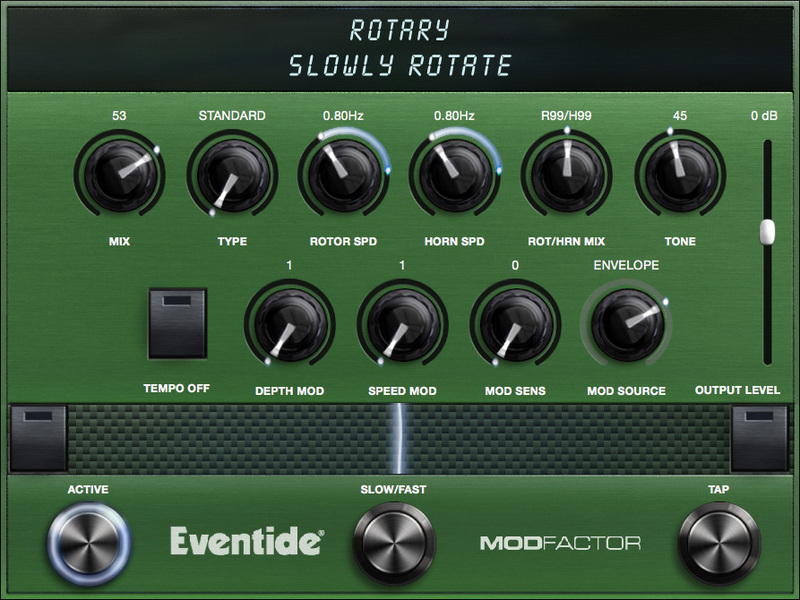 Turn effect on or off..
Set modulation speed to fast or slow. If Tempo is ON, the display indicates the current tempo in BPM (30 to 500 BPM) while tapping and the Tap LED will blink at the BPM rate. If Tempo is OFF, the display indicates the parameter value (milliseconds for most algorithms).